Raise Your Hand for Girls | Kid Reporters' Notebook | Scholastic Inc.
Lilian with 10-year-old activist Alice Tapper in Washington, D.C. Girls who lack confidence in school have a new champion. She is only 10 years old. 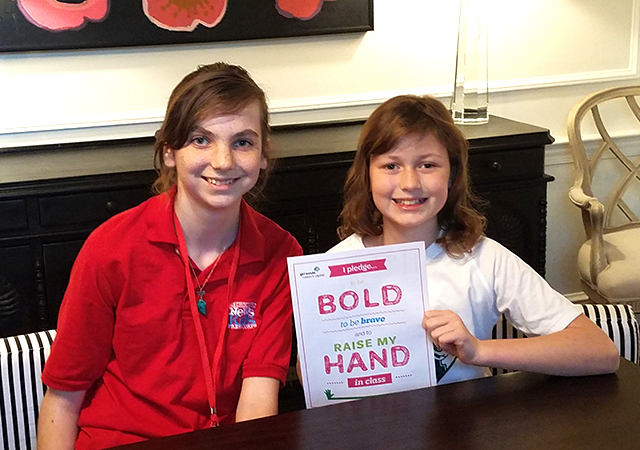 Meet Alice Tapper, a Washington, D.C., fifth-grader who says that her goal is to encourage girls of all ages to “be more confident in raising their hands.” Alice cared so much about the issue that she helped created a Girl Scout badge. The pink badge—Alice chose her favorite color—depicts three hands reaching for the sky. It says, “Be bold. Be brave. Raise your hand.” Scouts who want to earn it must recruit three girls to pledge to raise their hands in class more often. Alice’s idea came during a fourth-grade field trip to Jamestown, Virginia. Her inspiration was sparked, she said, when boys raised their hands to answer questions even though they weren’t sure of the answers. The girls just listened quietly. Members of Alice’s troop later reported that they’d observed the same thing with their own classmates. After the Girl Scout Council of the Nation’s Capital designed the badge and put it into circulation, Alice appeared on local television in Washington, D.C., to talk about her idea. Her father, CNN anchor Jake Tapper, tweeted about it. That led The New York Times to ask Alice to write an essay for the newspaper. Alice’s “Raise Your Hand” badge has become wildly popular, and not just in the United States. “People in Japan and China want to use the patch,” she said. The Girl Scouts sold out of the badge quickly, but they’re making more. Alice wants to be an animal cruelty investigator when she grows up. But first, she wants to see a revolution in confidence for girls of all ages. She knows that won’t happen overnight. “It takes time,” Alice said, “but maybe I can speed up the process.” You don't have to be a scout to take the pledge.